Concept albums are a stray from the usual path for most bands; just look at The Devil Wears Prada, whose Zombie and Space EPs are two of the most creative yet underappreciated releases in their discography. A band making an entire career out of concept albums is especially out of the ordinary, yet Crown The Empire have managed just fine, with their just-released third album Retrograde focusing on a narrative set in a cinematic space environment. The fact that Retrograde isn’t a terrible album may surprise a lot of people who aren’t already fans of Crown The Empire. Up to now they’ve been lumped in with the more generic metalcore scene, having toured with the likes of Of Mice & Men and Asking Alexandria. But while bands like those already have a set formula they follow, only making minimal changes across and between records to keep their large fanbases happy, Crown The Empire have no boundaries when it comes to ideas and it’s refreshing to see within this genre. Retrograde is easily their most ambitious release to date, and arguably their most confident. Notably, they’ve struck an effortless balance between Andy Leo’s clean vocals and David Escamilla’s uncleans, letting unclean inclusions act as more of a heavy garnish to more catchy, radio friendly tracks like Weight Of The World, along with allowing unadulterated ferocity to come to the fore at the end of Aftermath. It’s best when the two sets of vocals cooperate, like in Lucky Us, where Leo’s verses build up an intensity over chugging guitars before exploding into Escamilla’s rage-fuelled chorus. Seeing an actual marriage between the vocals is a nice change in a genre where screams are all too often just thrown into songs just for the hell of it. There’s a good amount of experimentation present on Retrograde, too. All bases of metalcore are covered, from the gritty weightiness Lucky Us showcases so well to the surprisingly irresistible Signs Of Life, which has just the right amount of out-of-the-box gimmicks – in this case acoustic guitar, epic rock chorus and peppering of a synth hook with no screams to be heard. The inclusion of both songs on the same record may sound a bit strange on paper but they truly work, which is why it’s so disappointing that the more by-the-numbers Are You Coming With Me and Zero seem to be the tracks Crown The Empire are backing in order to sell Retrograde. Of course they need to keep existing fans nibbling on the bait, but with material this good they could stand head and shoulders above others in their genre. 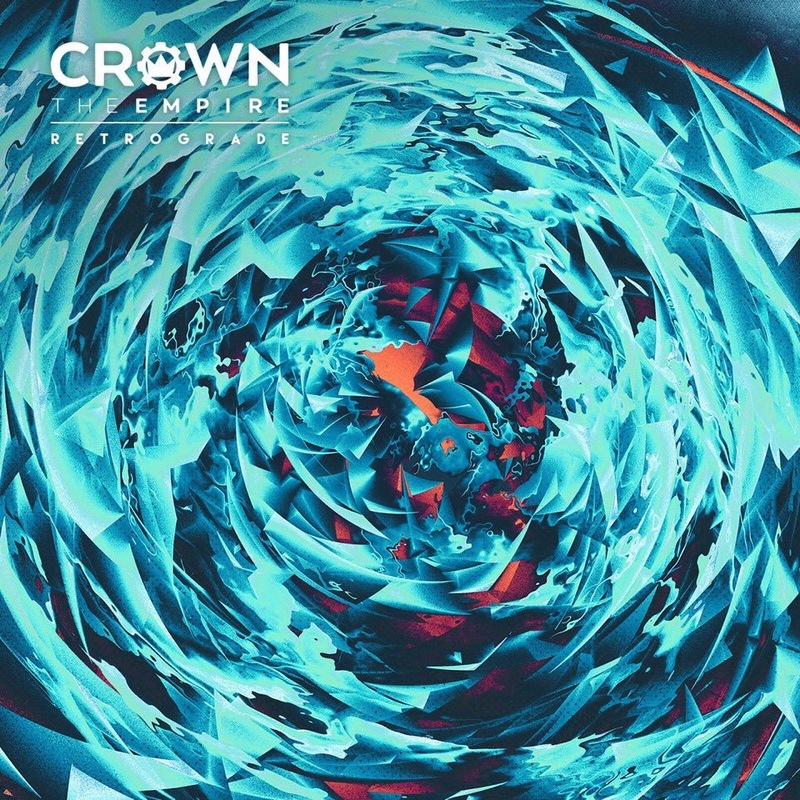 While a number of other songs on Retrograde do seem to lack the sparkle that would make Crown The Empire a truly great band as they are, there’s shedloads of potential and creativity here for them to become metalcore figureheads in the future. A lot of this comes from the narrative arc this album. Epic gang chants, clinical drum machines and autotune all give off a spacey feel when used in the songs on here, and the instrumental intro and interlude and mission control dialogues thrown into the mix tie everything together beautifully. Crown The Empire haven’t just made an album here, they’ve created a world, and the future knows no bounds. ‘Retrograde’ by Crown The Empire is out now on Rise Records.